BANGOR — Bangor Historical Society is partnering with the Bangor Fire Department’s Hose 5 Museum for the BHS’ first membership reception of 2018 to be held 4:30-6:30 p.m. Thursday, April 26, inside the Hose 5 Museum on State Street. Better known as “wine night”, the BHS hosts its membership receptions each month April through October. 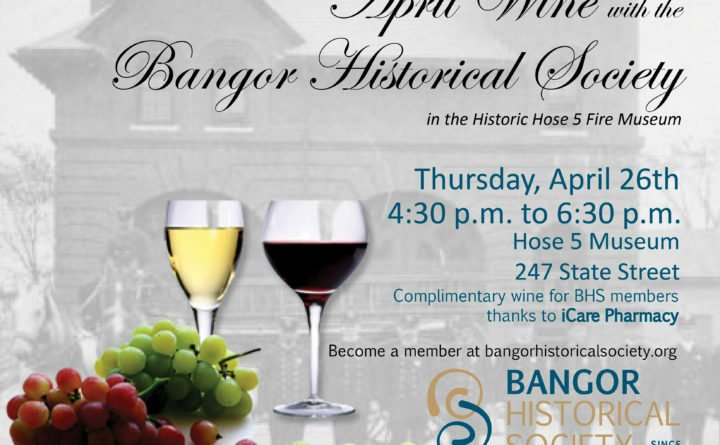 The events offer an opportunity for members to connect with one another and learn more about Bangor’s history while sharing complimentary wine and hors d’oeuvres. Annual memberships to the BHS begin at $25 and include admission to each of the membership events. Anyone who isn’t a BHS member can join ahead of the event online at www.bangorhistoricalsociety.org or at any event. Email director@bangorhistoricalsociety.org or call (207) 942-1900 for more information.